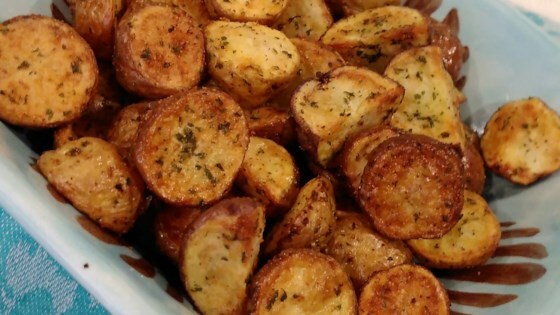 "These are very similar to roasted potatoes, crispy on the outside and fluffy on the inside. Enjoy!" Preheat an air fryer to 350 degrees F (175 degrees C). Combine potatoes and oil in a bowl and toss to coat. Add 1/4 teaspoon granulated garlic and 1/4 teaspoon parsley and toss to coat. Repeat with remaining garlic and parsley. Pour potatoes into the air fryer basket. Place the basket in the air fryer and cook, tossing occasionally, until golden brown, about 20 to 25 minutes. Feel free to use olive oil in place of avocado oil. Maybe I didn't use the right potatoes - the insides weren't fluffy and the outside was a little chewy. What type of "baby potatoes" are best to use? I used little multi colored ones. Love it. My family loved it. They came out browned and crispy. The only change that I made was, I used olive oil instead of avocado oil. Tasted great. Will you make often. This was delicious! We will be making this again, I promise you! Great potatoes! Pretty perfect. Suggestions: add a little more oil for a little more crunch, thyme and or chopped green onion. Only made one change, I used olive oil. They looked and tasted great, thank you Bren for a delicious recipe.